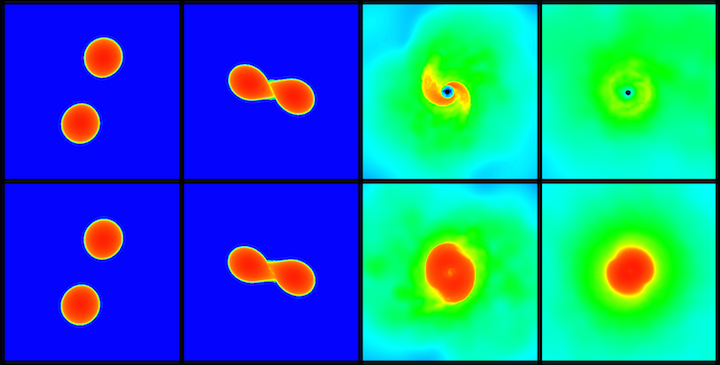 The upper and lower series of pictures each show a simulation of a neutron star merger. In the scenario shown in the upper panels the star collapses after the merger and forms a black hole, whereas the scenario displayed in the lower row leads to an at least temporarily stable star. (Picture: Andreas Bauswein, HITS). Neutron stars are the densest objects in the Universe; however, their exact characteristics remain unknown. Using simulations based on recent observations, a team of scientists including HITS researcher Dr. Andreas Bauswein has managed to narrow down the size of these stars. In neutron star collisions, two neutron stars orbit around each other, eventually merging to form a star with approximately twice the mass of the individual stars. In this cosmic event, gravitational waves – oscillations of spacetime – whose signal characteristics are related to the mass of the stars, are emitted. This event resembles what happens when a stone is thrown into water and waves form on the water’s surface. The heavier the stone, the higher the waves. The scientists simulated different merger scenarios for the recently measured masses to determine the radius of the neutron stars. In so doing, they relied on different models and equations of state describing the exact structure of neutron stars. Then, the team of scientists checked whether the calculated merger scenarios are consistent with the observations. The conclusion: All models that lead to the direct collapse of the merger remnant can be ruled out because a collapse leads to the formation of a black hole, which in turn means that relatively little light is emitted during the collision. However, different telescopes have observed a bright light source at the location of the stars’ collision, which provides clear evidence against the hypothesis of collapse. The results thereby rule out a number of models of neutron star matter, namely all models that predict a neutron star radius smaller than 10.7 kilometers. However, the internal structure of neutron stars is still not entirely understood. The radii and structure of neutron stars are of particular interest not only to astrophysicists, but also to nuclear and particle physicists because the inner structure of these stars reflects the properties of high-density nuclear matter found in every atomic nucleus. While neutron stars have a slightly larger mass than our Sun, their diameter is only a few 10 km. These stars thus contain a large mass in a very small space, which leads to extreme conditions in their interior. Researchers have been exploring these internal conditions for already some decades and are particularly interested in better narrowing down the radius of these stars as their size depends on the unknown properties of density matter. The new measurements and new calculations are helping theoreticians better understand the properties of high-density matter in our Universe. The recently published study already represents a scientific progress as it has ruled out some theoretical models, but there are still a number of other models with neutron star radii greater than 10.7 km. However, the scientists have been able to demonstrate that further observations of neutron star mergers will continue to improve these measurements. The LIGO and Virgo Observatories have just begun taking measurements, and the sensitivity of the instruments will continue to increase over the next few years and provide even better observational data. “We expect that more neutron star mergers will soon be observed and that the observational data from these events will reveal more about the internal structure of matter,” HITS scientist Andreas Bauswein concludes.